Hey all and happy Monday! Just got back from vacation last week and I feel like I need a recovery time from it! I was so thrown off coming back and trying to just settle back into normal routines. I have been running around like a crazy person with errands, events, shopping, etc…. so I am hoping this week slows down a bit! I had the pleasure of traveling to the West Coast for a little over a week with one of my best friends from Germany! We met in 2010 during a study abroad in the UAE, and we have traveled together at least once a year since. We started in San Francisco…. and it was everything I remembered it to be! We had a rental car (thankfully), and I am so happy because those hills are no joke! Also, it is such a huge city, so it was nice to be able to see so much of it! We stumbled upon this house while driving and I knew we had to take photos in front of it! 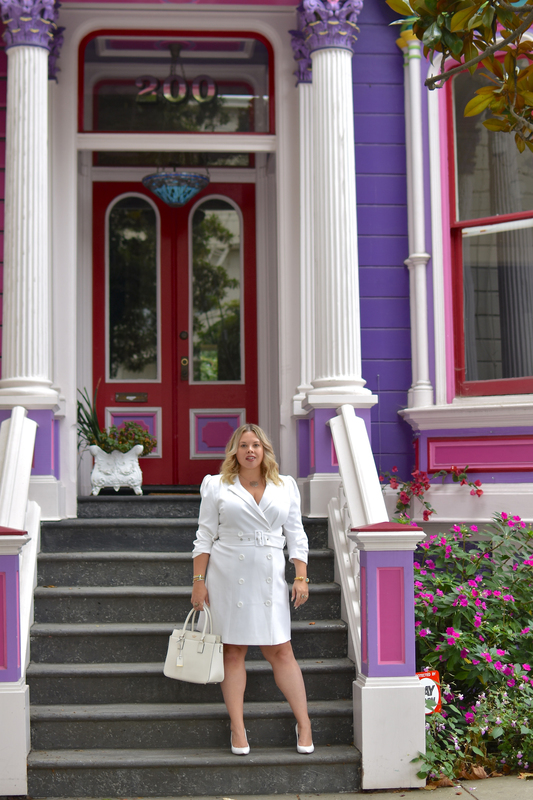 I figured an all white look would be perfect in front of it! It is such a unique house and so colorful, so I didn’t want to wear anything too bright in front of it. 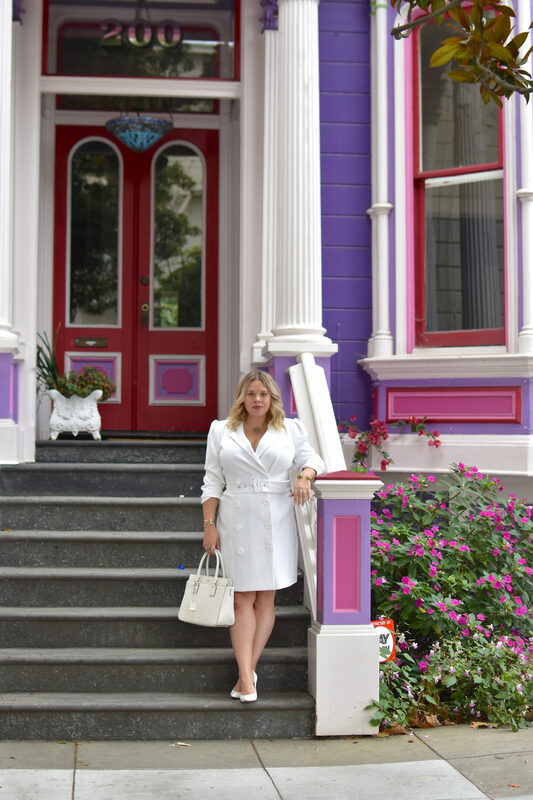 Plus, I have needed an occasion to wear this white blazer dress! Eloquii really came through with this one, it was everything I have been waiting for in a blazer dress. 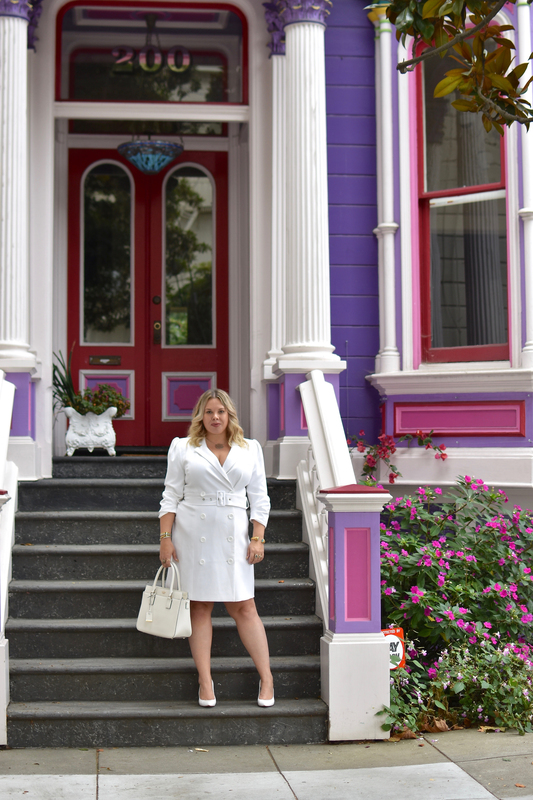 I wanted to keep the look all white… I really love a good monochrome look! 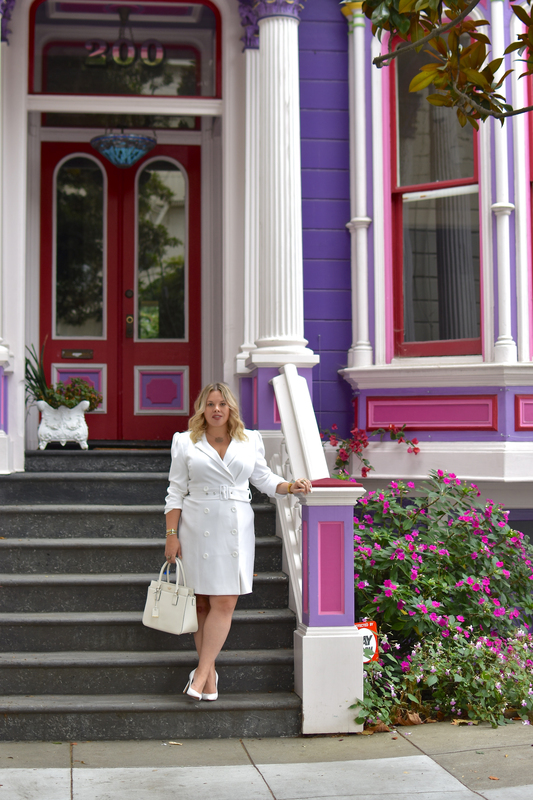 So, I snagged some white pumps and a white bag to complete the look and pose in front of the house of my dreams! Perfect white on white look! I love this outfit, it is seriously stunning! The dress fits you so perfectly and you couldnt have picked a better location for these photos! Girlllll that DRESS! You are totally killin’ it! I LOVE the clean lines in this outfit! Suits are one of my favorite trends right now! This blazer dress looks superb on you! I just love how it’s belted around the waist for that added oomph! You look gorgeous! And I’m SO into White After Labor day!!! Sounds like an amazing trip! I am absolutely loving this dress! I love the fit and white is so chic! I love the colors on the house and dress flows with it so pretty ? You look so business chic!